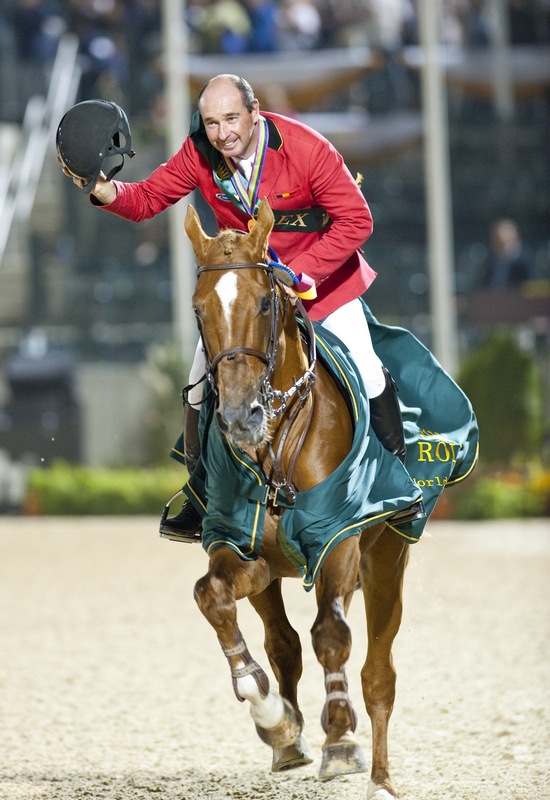 Lexington, KY — After five days of competition, six different courses, and a total of 115 jumps, Belgium’s Philippe Le Jeune took home the gold medal in the Show Jumping World Championships, presented by Rolex, at the 2010 Alltech FEI World Equestrian Games. Aboard all four horses, including with his Vigo D’Arsouilles, Le Jeune was the only rider to finish with 0 faults over tonight’s four rounds. Abdullah Al Sharbatly of Saudi Arabia took the silver medal with 8 faults this evening, and Canada’s Eric Lamaze took home bronze with 9 faults. Brazil’s Rodrigo Pessoa, the 1998 world champion, was a close fourth with 12 faults. Le Jeune has ridden in three previous World Equestrian Games and was on the bronze-medal Belgian team in 2002 aboard Nabab de Reve, the sire of Vigo D’Arsouilles. He is the second consecutive world champion from Belgium—Jos Lansink, who rode on the Belgian team here, earned gold four years ago in Aachen (Germany). Le Jeune said he always takes the time to pat each horse and try to get to know it before he rides it—which is something he did tonight with each of his mounts. The Rolex Top Four is unique among equestrian sports—each rider rides each of the four horses over the same course in, a true test of horsemanship. They have three minutes warm up with each horse and can jump two jumps. Each horse was accompanied to the ring by the groom, chef d’equipe and trainer. 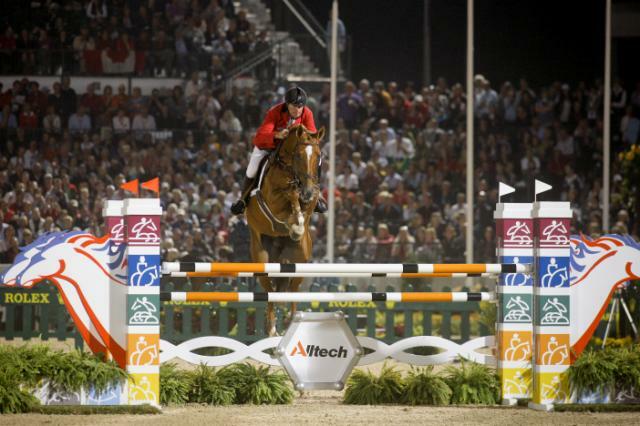 Al Sharbatly, 28, and Pessoa, 37, picked up faults in the first round on their own mounts. 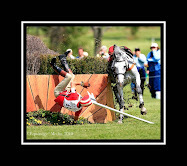 But Al Sharbatly, who had two rails aboard his Seldana Di Campalto, didn’t earn a single fault on the other horses. Pessoa picked up 4 faults aboard his HH Rebozo and then another 8 aboard Vigo D’Arsouilles. Lamaze was clear until he added a rail and 1 time fault aboard HH Rebozo and then another rail aboard Seldana Di Campalto. 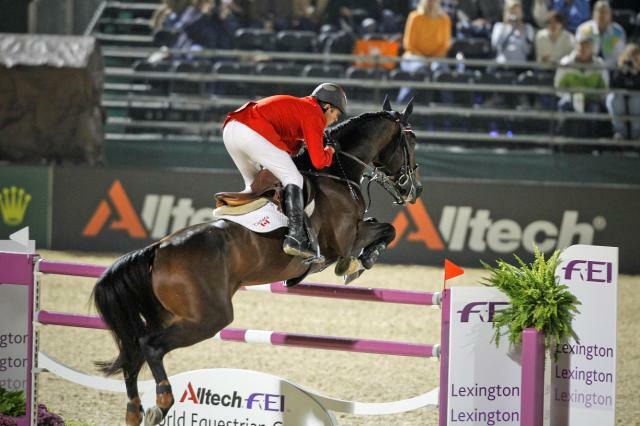 Al Sharbatly, the youngest competitor in the Rolex Top Four, was the only competitor to start tonight’s competition without knocking down a single rail during the competition. He was also by far the least experienced of the group and is proud to have won the Middle East’s first medal at a World Equestrian Games. 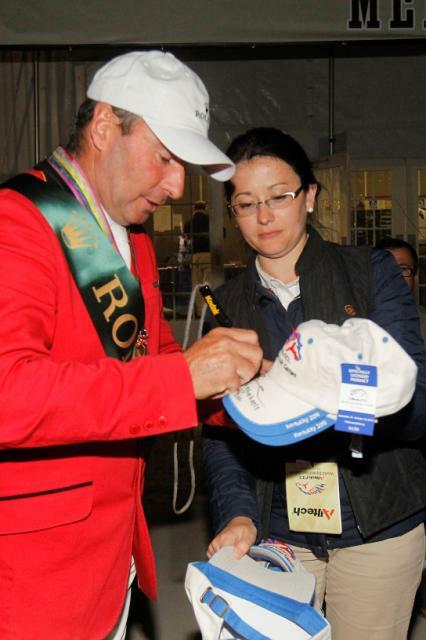 Best horse honors tonight went to Canada’s Hickstead. 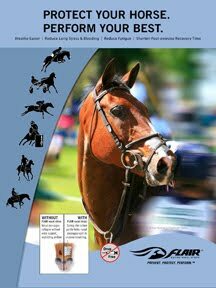 The 14-year-old stallion was the only horse to complete the course four times with no faults at all. 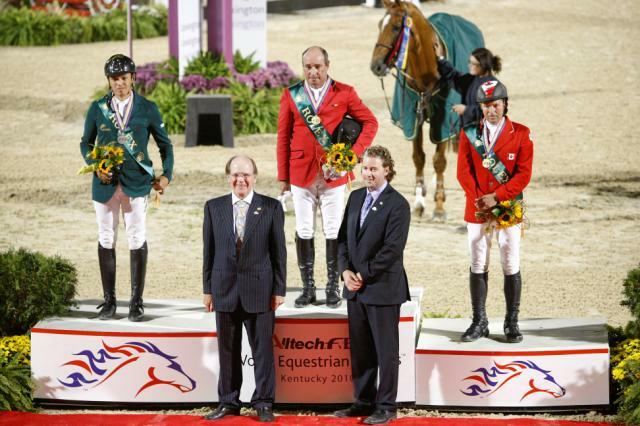 At the beginning of the week 121 riders started this competition, from 41 nations.